Former Secretary of State Condoleezza Rice speaks with Spectrum editors on Wednesday evening. Fiona O'Loughlin talks about the benefits of thrifting for spring trends. Eighteen-year-old Sebastian Serafin-Bazan died on Wednesday after Friday's alleged hazing on South Campus. The Buffalo Chips, UB’s all-male a capella group is performing their Spring Fling concert this Friday in Slee Hall. The concert is a celebration and send-off for the group’s senior members. The Notre Dame Cathedral caught fire Monday night. The fire destroyed the roof and middle spire. Singer Kiana Ledé will open this year's Spring Fest on May 4. 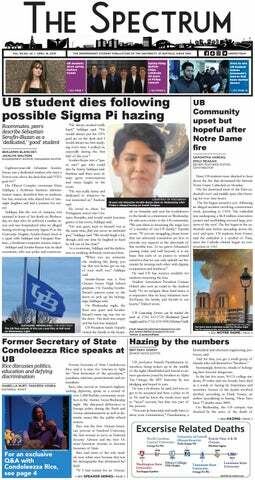 Jared Houghtaling, a junior accounting major, discusses UB’s suspension of all Greek-life activities. The suspension came after freshman Sebastian Serafin-Bazan was hospitalized Friday. The Black Student Union Vice President Daniel Edwards speaks to students to commemorate the life and death of rapper Nipsey Hussle on Wednesday. A proposed map of the metro rail expansion which will “seamlessly connect” UB North Campus and Downtown Buffalo.